Ashley Harlow is specializing in Educational Policy and Social Context (EPSC). 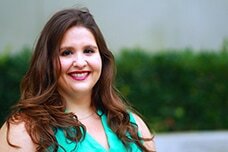 Her research interests include studying how Hispanic students graduate and transition to higher education institutions and what factors lead to low college graduation rates for Hispanic/Latino students. She is particularly interested in education policies that help underserved students transition to higher education institutions. Ashley is a Southern California native from Banning, California, who received her B.A. in Sociology and Psychology at the University of Southern California. While completing her undergraduate studies, Ashley participated in both the McNair program and was a Mellon Mays Undergraduate Fellow. After receiving her undergraduate degree, Ashley taught 11th grade U.S. History for three years in Northeast Los Angeles at a charter high school. While teaching, she received her Master's in Education at Loyola Marymount University. Ashley is a recipient of UC Irvine’s prestigious Eugene Cota-Robles fellowship, UCI's Provost Ph.D. fellowship, and the Higher Ed Teaching and Learning Research Fellowship.